With the Cape Piscatorial Society’s office still not fully functional and Jean away, the regular newsletter is once again posted here for the benefit of the members. I trust that you will find it useful. Of course it could simply be that I am getting old, I don’t remember fishing so many times in the early season and being so darn cold all the time. Perhaps my memory is failing, perhaps my blood is thinning or possibly it is simply that for years the rivers have been too high to fish in September so I never noticed? Hell I don’t know but it has been a “Funny Ol’ start” to the season. Perhaps it is simply that over the course of the close season our dreams are made up of rising trout, clear water and blazing sunshine because that is how we like to think of our fishing more than the fact that it is the actual reality of things. Apparently memories are selective, which is why we have larger families than perhaps we should for the well being of the planet. According to the experts, if women really remembered what child birth was like and didn’t simply switch on false recollections of sweet little glowing cherubs then we would be into negative population growth in short order. Either way be it reality or a false recollection of “the way things were”, I have to say that I have personally had something of a disappointing start to the season and haven’t really “Hit it right” as of yet. I have received some reports of anglers who have had great fishing but I would have to say that on average the reverse has been true and most seem to have enjoyed less sport than they expected. There are other oddities as well, I like to believe that everything in nature has a logical answer; trouble is that we don’t necessarily understand or see that answer. Take for example the browns on the Smallblaar/Molenaars beats. Not a week or so ago in pretty grim conditions Mike Spinola took a number of really good quality browns whilst I didn’t manage any and only caught small rainbows. A week later Mike fished the same water and lo and behold he only caught rainbows, that is the same angler on the same beat, odd. I have for a while wondered if browns don’t respond differently ( compared to the rainbows), to variations of water height, barometric pressure and the like but I don’t really have an explanation for this state of affairs, although as said I suspect that there is one. It could be an advantage in that when one species isn’t playing ball the other is but it is something of an oddity none the less. Anyway perhaps the cooler and variable conditions are a blessing, one suspects that we have had a lot less rain than usual and should things heat up too quickly we are likely to be in for a hard time of things come summer, I say come summer as it obviously has yet to arrive based on the time it takes in a hot shower for me to recover after a day on the water. 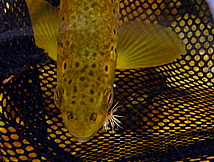 Fishing tiny dries on fine tippet to large cruising fish proved very interesting. I shan’t bore you with all the details here, you can look them up on a previous post on the Paracaddis Blog (Big Fish on Fine Tippets) if you so wish, but I did have a very interesting trip last weekend. I suppose that every fishing day is a little different and the purpose of the day can change unexpectedly. Some times I am happy working on getting great presentations, sometimes I want to catch a lot of fish and then there are those outings when I simply want to target one particularly tricky trout, it all depends. One thing that I do enjoy on occasion is to experiment, to see how fish react to different things and for that matter how I react to them. This past weekend I unexpectedly found myself experimenting on how large a fish I could tackle on tiny flies and ultra-fine tippets and the results were quite amazing. I took fish up to nearly three kilos on size 18 dry flies and 7X tippet and broke off or lost an amazingly small percentage of the fish. Don’t kid yourselves, these weren’t simply flaccid, tailless stockies, these fish went wild when hooked and I saw my backing more than once, something of a rarity on my three weight I have to say. Again I would recommend that you have a look at that post on the blog, but one thing that it did make clear to me, there is absolutely no reason why one should feel under gunned fishing ultra-light tippet on the streams. 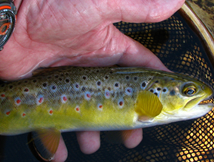 Further that if these relatively uneducated trout react so positively to tiny dries and so negatively to the nylon then it does behoove us to take a little more care and consideration when targeting the trout in the streams. In fact I would suggest to you that if you don’t already take a spool of 7X with you (and quite possibly 8X for that matter) and that you don’t carry some form of leader de-greaser as well then you are limiting yourself, particularly as the water levels drop and the sun comes out. I do hope that it will come out, one supposes that will be the case at some point. 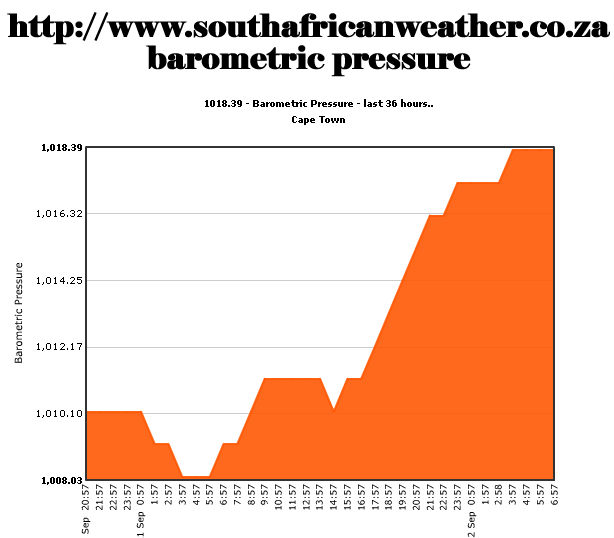 It appears that one site that I have been using and recommending for weather info and barometric pressure had some problem with it however it seems to be working fine again now the link for the main site is http://www.southafricanweather.co.za. Detailed Barometric Pressure Charts are available from this site. The detail is quite amazing and I include a screen shot of the forecast for the weekend as an example. 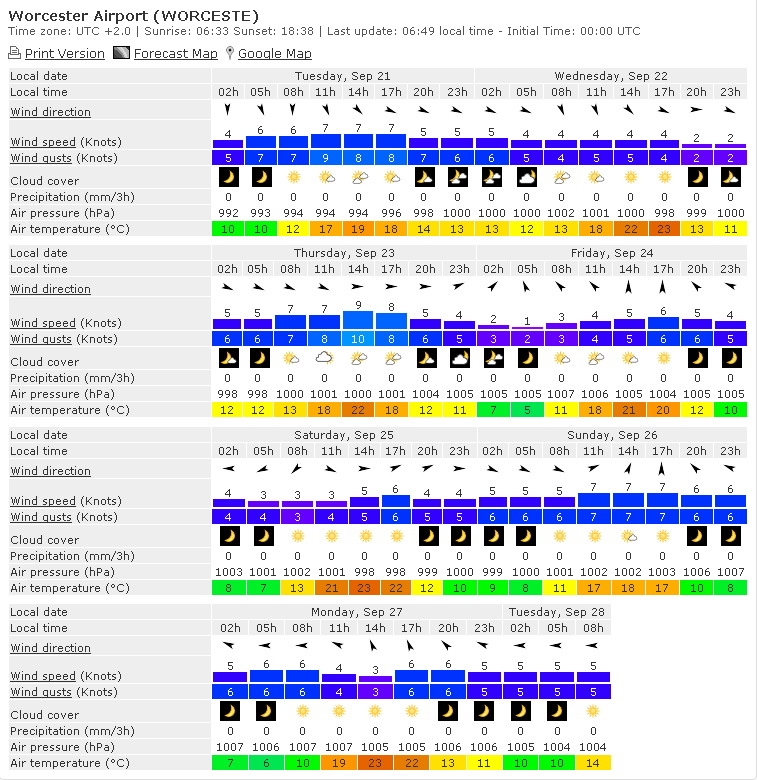 It however doesn’t seem to be deadly accurate as I was on the river on Tuesday and whilst the forecast indicates no rain, it rained for most of the day, at least in the mountains. I have been having a lot of fun with parachute patterns of late, as per the above and I have developed some great improvements in the way that I tie them which makes them more durable, I think more imitative and a whole lot easier to tie, particularly in small sizes. I shall be giving a demo of these techniques at the Stream X Fly Fishing Heritage Day celebrations at Stream X on Friday if you would like to learn more. Some but no longer all, of the modifications can be found in a free downloadable E-book at Smashwords if you have yet to look at that. River conditions: From fishing on Tuesday I can tell you that the water levels are up again, probably a welcome thing in the longer term but there must have been more rain in the mountains than there was in Cape Town one would imagine, so be prepared to take some nymphs with you and a rain jacket. Luckily we did both but the wind was very chilly and the rain on and off for the entire time we were up there. The weather is still looking a little cool and dodgy over the next few days, but one is going to hit right at some point and as my old saltwater fishing mate Greg Clarke used to say “in fishing there it is no good waiting for the news, you need to get out there and make the news or you are going to miss it”. This newsletter is hosted on “The Fishing Gene Blog” courtesy of Inkwazi Fly Fishing Safaris, the Cape’s longest standing full service trout guiding operation. Would you believe that despite the onslaught of cold fronts I have actually managed some fishing this past week. Thanks both to Paddy Coleman a client and friend who wanted to fish Lakensvlei, and to Ian Lourens who kindly allowed me to once again use his boat. We headed out of Cape Town late on Monday evening and had a very pleasant stay overnight at the Ceres Inn before heading out just after breakfast to hit the water. We had considered the option of foregoing the pleasures of a cooked breakfast and hitting the water at first light, but really come the frigid dawn the idea lost it’s appeal and we only pushed the boat out at around nine. There was a slight breeze blowing down the dam and slightly towards Bob’s house which seemed pretty pleasant for drift boating. You may recall that my last trip up there suggested that the fish were feeding in deeper water on daphnia and perhaps the odd crab and given that for Paddy it was his first attempt at drift boating I thought we would aim for a long drift down the middle so as to “settle into” the process if you will. Now the international teams, who have a great deal more expertise at drift boat fishing than any of us South Africans will tell you first find the fish, then worry about the depth and finally the fly. This piece of advice has always stuck with me and I take it to mean that in a boat the first thing that you want to do is cover water. There was a time when I would never have fished out in the middle but it has worked for me before, and with word from the locals that they had also been taking fish in deeper water, and given that there can’t be much to eat out there in the middle other than daphnia I put on a select of flies including a hot orange Booby on the top dropper. Orange is a traditional attractor colour for daphnia feeders, but this first drift was really supposed to be a matter of getting into the swing of things. We hadn’t drifted thirty yards when I hit the first fish, a superb silvery rainbow and within two casts I hooked up his brother. Then another two casts and I was into fish again, it seemed like we had really cracked the code but the last fish had badly tangled the leader in the net and by the time I had it sorted we had drifted out of the action. Aiming to repeat the drift we rowed back and started again but the notoriously fickle wind at the dam had us blowing much faster and in a different direction this time and we missed the fish. No matter what we did we couldn’t repeat the drift over what I was sure was a serious concentration of fish and we remained fishless for several hours despite working hard at finding them again. We picked up a gorgeous brownie up in the inlet arm but that seemed to be a once off event and we found no more fish. Eventually the wind abated and swung back again and we could drift more in the region where we had contacted fish in the morning. Paddy had a similar experience to mine on one drift and after hours of trying he took two fish in two casts. I picked up one more and that was about it for the day. Eight fish in total, all taken on sinking lines and every single one of them took the orange booby. So it turned out that we had found the depth and the fly , we had even found the fish, it was just tricky to stay on them with the variable winds. All in all an interesting day , although we worked really hard at it, success coming in fits and starts depending almost entirely it would seem on whether we could get the boat over that pod of fish. We didn’t kill any, so I can’t confirm that they were on daphnia. Perhaps it is better that I don’t know, nicer to imagine that one is right than to risk finding out the opposite. Wherever you are fishing next, I hope that you will “find the fish”.. Here we are a third of the closed season over with and for once the berg winds are blowing and winter seems to have taken a slight step back. If you are a meteorologist or simply a pessimistic old fart you will know that this in more than likely a harbinger of climactic holocaust to come but for now I suppose one should try to enjoy it. There is due to be some rain today but the first part of the weekend is predicted to be warm and sunny again so a pleasant time to be out and about on a dam somewhere casting a line. Eikendal, Jonkershoek http://www.jonkershoek.com and La Ferme http://www.laferme.co.za all offer fishing relatively close to home and will provide the chance to still get away in time to watch the rugby in the afternoon. My only trouble is that I have been so busy with tiling peoples bathrooms and laying laminate flooring that I really haven’t even considered fishing for the past week and have no plans that things are likely to change on that front in the near future. I did venture out ,at the kind invitation of Mercedes Labuschagne, to fish at La Ferme last Sunday, the weather was great, even perhaps a little too pleasant for quality fishing but it was glorious out there in Franschoek and well worth the trip if only for the drive through some spectacularly scenic countryside. There was a pretty good turnout of anglers for their competition and although the fishing was a little slow, fish were caught, prizes awarded and I think that pretty much most of the people enjoyed there time. One of the wonderful things about such venues is that they offer a great opportunity for children to start enjoying fly fishing in relative ease and safety at the same time. Lets face it, our streams these days are not the ideal place for a young neophyte to cut their angling teeth and the smaller venues with plenty of casting space offer a wonderful introduction to fly fishing. There were a number of youngsters fishing and I was most encouraged to see them there, in the days of PlayStation and other electronic and indoor distractions it seems that far too many children don’t get out and about anywhere near as much as they should and when you live in a place as attractive as the Cape one can’t help but think that is a pity. Not to mention darned unhealthy to boot. So a very big thank you to Mercedes for the invite and if you have never been to La Ferme you should plan a visit some time. What with lovely surroundings, cottages to rent and ostriches and buck wandering about the place it would make for a super weekend getaway with the kids, get in some fishing and still not requiring you to drive too far. There is a further report back and some images of the competition venue to bee seen on my Fishing Gene Blog at https://paracaddis.wordpress.com if you would like to see that. Don’t forget to link to the RSS feed on the blog so that you can be notified of updates other than the CPS news. There will be more coming along on there in the near future, including fly tying information and of course as soon as the streams open one would hope that regular updates of the state of play on our waters will feature as well. Don’t forget the Jonkershoek Juniors Develo Junior Fly fishing festival is to be held at Jonkershoek on the 11th, more information can be obtained from http://www.jonkershoek.com/events.html plus for the more chronologically advanced there is the Bells Fly Fishing festival on the 25th of July , that is if the juniors leave any fish in there for you. Information available from the above web site. From all accounts the fishing at Lakensvlei has slowed down a bit of late, I suspect that the fish are getting a little distracted by the breeding season and with hormones raging they are playing silly blighters and proving a little more difficult to tempt to the fly. Still that said the fishing was tremendous before and it isn’t half bad now either but on my last visit it required some work to find fish and rewards come to those who persevere, try different lines, methods and flies and cover some water to try to find the fish. Craig Thom has been doing quite a bit of work on the CPS website at www.piscator.co.za and things there are being revamped gradually. One of the innovations is to have revolving advertising so that all advertisers get a fair crack of the whip, you may have noticed the changes. For those with services, venues , tackle or whatever for sale to the fly fishing community the advertising offers some cost effective exposure to a selected target market and you can get your banner put onto the site for only R750 per annum, peanuts on the advertising front these days. If you are interested please contact me on rolston@iafrica.com or Craig at craig@netbooks.co.za . Should you require any assistance in designing your banner I can do that for you for a small fee so even if you are not a graphically orientated person there is no reason to miss out on the opportunity. Links to your own websites etc come as part of the package so let us know. This reminds me that I am not sure if Craig has yet put downloadable subscription forms on the site yet? I will check up as subs are now due and we will make sure that you can get the required information from the site by next week. Finally sorry that there has been a glitch in transposing the internet links on this newsletter to the e mail verso sent out to members, I am hoping that we will have solved that problem but if not know that we are working on making it all easier for you. 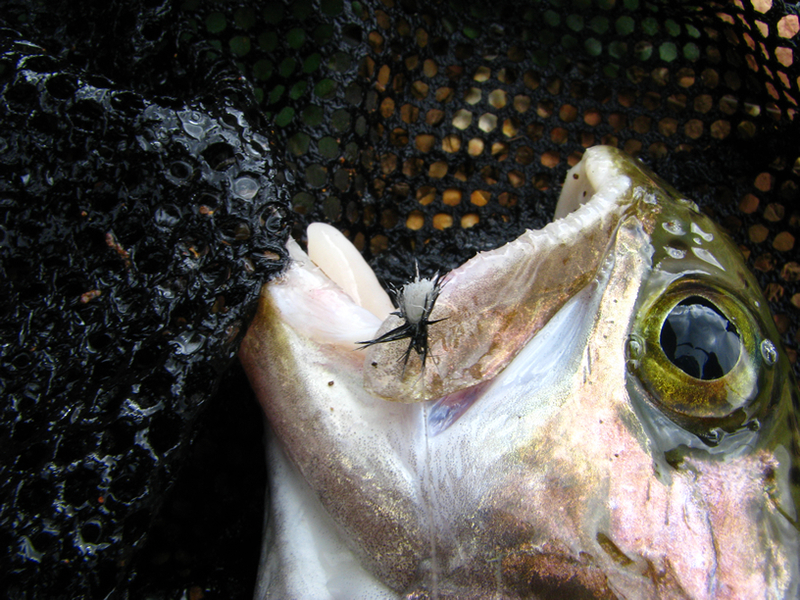 For now if you can get out fishing make the most of the weather, if not tie a few flies, the stream season is approaching faster that you think and as always it pays to avoid that made dash to the vice in August when you suddenly realize that you boxes are severely depleted. Right the sun is up and after a very early start to the day to keep you all informed I have to get on my bike and do some more work, no rest for the wicked. If you are venturing onto the water somewhere, as always “Be Careful Out there”. Well not a whole lot going on in my little fishing world right now, the poor weather and the desperate need to actually do some work has sort of interfered with things a little. I did have another attempt at the carp over the weekend in the good company of Tom Southwood. Tom really just wanted to get the hang of some shortline nymphing technique before he heads up to the Orange River and he did at least hook a carp. Close enough for him to get something of a surprise as to the size of the brute but the line snapped or something and it was lost before hitting the net. Mind you it stayed on just long enough to make the look on his face a real picture. Although my life is spectacularly boring from the fishing perspective there are a number of events and happenings of note in the near future which may well be of interest to you all. Fly Fishing competition in Franschoek. Juniors Fly Fishing Festival at Jonkershoek. Then Jonkershoek are hosting in conjunction with Develo Flies a Junior fly fishing festival out at their venue in Stellenbosch on the 11th of July. You can pick up more information about the event from the following links. www.inkwaziflyfishing.co.za/develojuniors.pdf but just in case you think that it is only of interest to juniors there will be a raffle for a grand prize of ten grand’s worth of Sage fly fishing gear so might be worth taking your son along, entering the draw and having some coffee whilst you wait to see if you are a winner. Proceeds will go to the Pebbles project to assist children with special needs. New Stocking at Fly Talk / Eikendal. Phillip tells me that they have restocked and have put some fish in the bottom dam now as well, so your chances of success are accordingly increased. FOSAF joint meeting with Yellowfish Working Group, the committee supplied me with the following information for publication to draw your attention to the following. So there it is, all news and no news really, a lot going to be happening in the near future but not a lot to tell you about right now. In case you don’t know, and to be honest I didn’t until a few weeks ago, you can be notified of updates on this blog by clicking the RSS feed notification at the bottom of the page. You can then elect to have notifications sent to your e mail (Microsoft Outlook for example) and not have to check in to see if there is anything new as you will be notified of any updates when you log into your e mail. So as I sit the rain is hammering down outside, the rivers will be in full flood and for once I need not worry about it as the season is closed. In fact it has been almost a month and although the withdrawal is severe we are almost a third of the way through the doldrums and before too long I am going to have to start sorting out those fly boxes, organizing some new wading boots and generally getting myself in gear for spring. Well it is still a long way off but no harm in dreaming about it. If you are venturing out over the weekend, as always “Be Careful Out There”..